Inspired by the great American woodlands, the WD-01 Woodline Large Fixed Blade Knife from SOG is a camping essential as well as a rugged work of art. The beautifully crafted, hardwood handle features a machined finger groove to offer superior handling without sacrificing any of the Woodline's aesthetic craftsmanship. 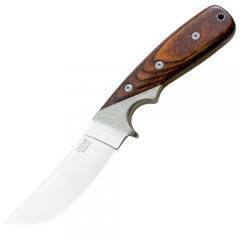 A large, upswept-style blade offers maximum edge surface to provide superior cutting power needed for camping, hunting or tactical operations. Deep thumb groves along the spine of the blade allow users to apply greater pressure for improved cutting strength and control. Whether working in the field, enjoying a camping a trip or relaxing at a barbecue, SOG's Woodline knife is guaranteed to get the job done and turn a few heads in the process.